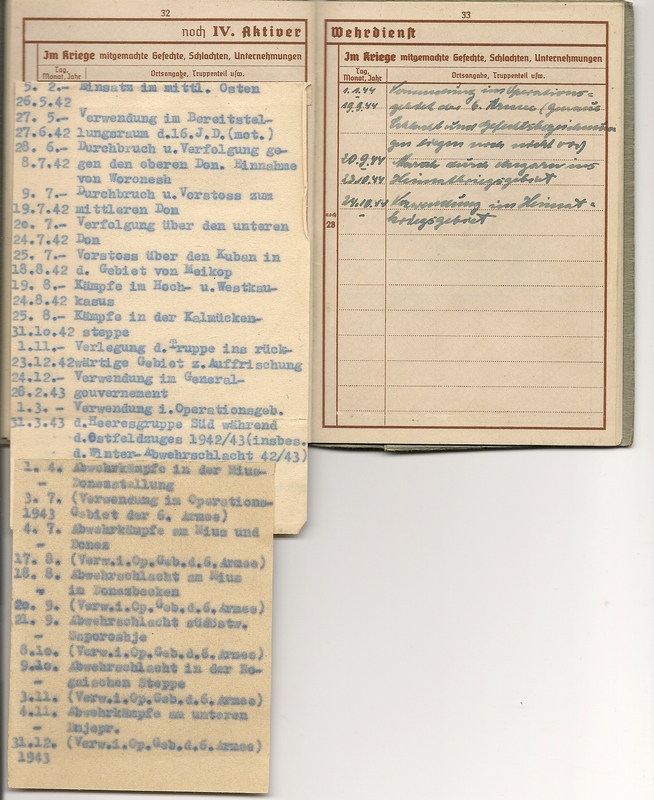 The next pages of relevance in the Wehrpass is usually page 12 which details the units the soldier spent his career with. It is largely the information on Page 12 that makes the Wehrpass collectable or not! As we can see from the scan Hans spent his war with Werkstatt Zug 550 and then 566. The Werkstatt Zug was essentially the mobile repair unit of the parent division. Hans’ skills as an auto mechanic in civilian life would have stood him in good stead in his war time service. More detail about the Werkstatt Zug can be found in this article from Lone Sentry. No doubt his services as a driver would have also been employed. Likewise it also explains the award of the War Merit Cross with Swords Second Class. 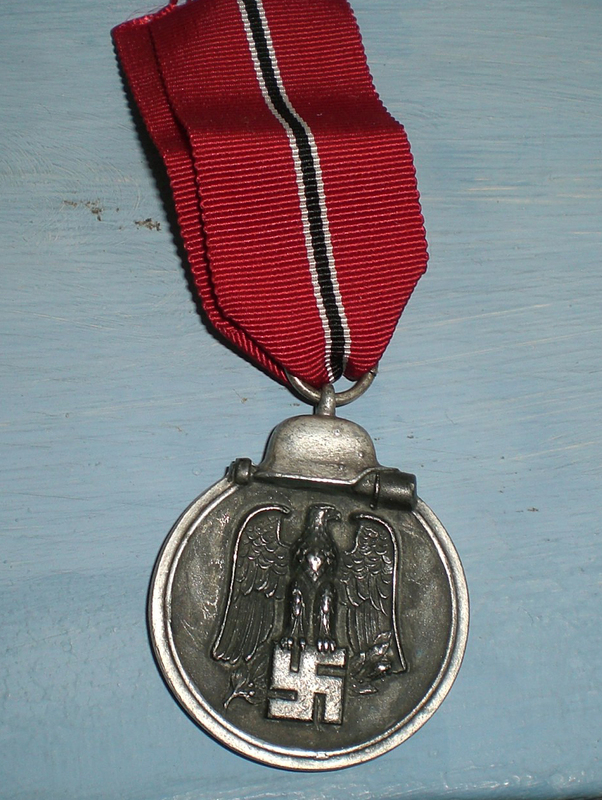 It was a lesser award than say the Iron Cross Second Class but recipients must have been in an area that could have come under direct enemy fire or interdiction to able to qualify for the award. The 16th Infanterie (Mot) Division has a busy war time career and thus Hans would have no doubt been close to action on more than one occasion. Pages 22 and 23 contain the information about any promotions or awards the soldier received or earned. In Hans’ case page 23 records his two aforementioned awards and their awardng units. Once again we see the stamp with FPN 41944 and the signature of an Oberleutnant (1st LT) authorising the award. His Ostmedaille however seems to have been awarded when he was serving with KW-Trop 666, a unit used for special purposes hence the z.b.v abbreviation you can see in the scan. His promotions record his service as first a driver, then a Gefreiter and then an OberGefreiter. Promotions in the German Army were usually back dated to the first day of any given month in order to facilitate pay. 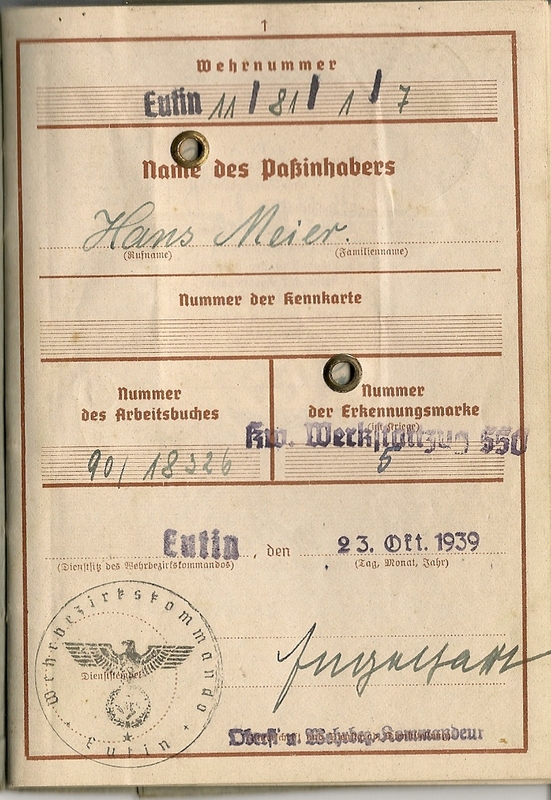 Page 3 of the Wehrpass held the personal information of the soldier, his place and date of birth and boxes 3 and 4. His nationality in box 5, more often than not it was Deutsch Reich (often abbrieviated to DR). However there are many cases of Volksdeutsch (people of German origin) Wehrpass holders that also have which country they hail from (I have a Wehrpass in my collection to a soldier whose nationality is DR Rom, ie a Volksdeutsch from Romania). Hans Meier was from Silesia in Prussia, now a part of Poland. 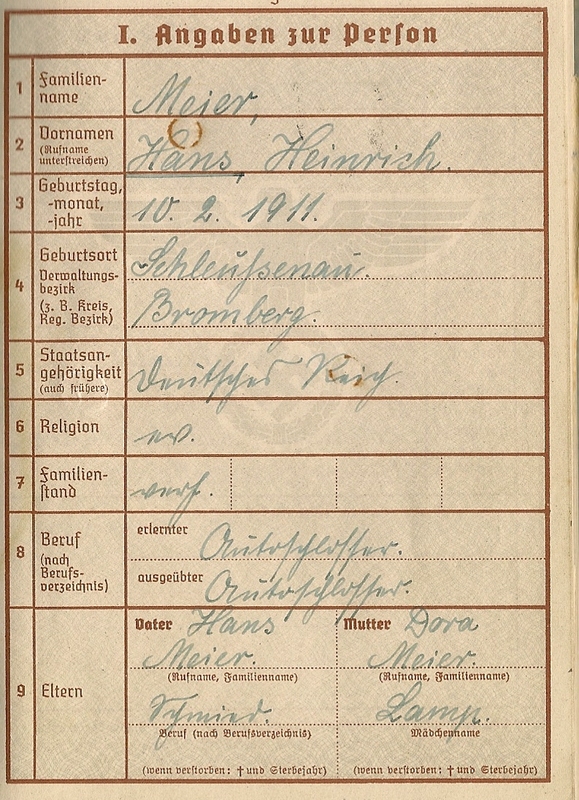 Boxes 6 and 7 tell us his religion and marital status (Hans was a Lutheran and was single at the time of issue and if a soldier married this section was updated). Box 8 tells us what the soldier’s civilain occupation was and in Hans’ case he was an ‘Autoschlosser’, ie a car mechanic. This makes total sense with his posting in the motor pool of the 16th ID. The soldier’s photograph was attached on page 2, normally stuck to the page and stamped at both corners. The soldier was also required to sign his photograph. Page 4 would detail the soldier’s education and any skills or qualifications obtained in civilian life. 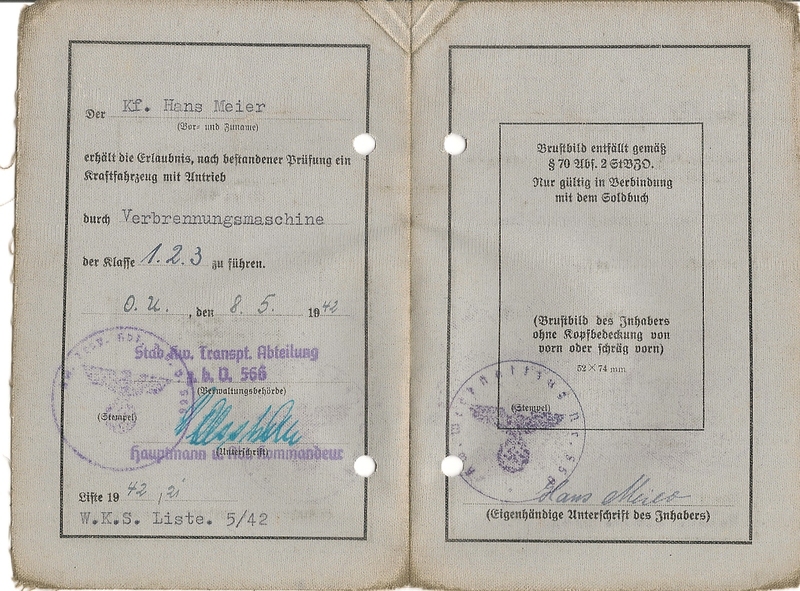 Being an auto mechanic (Autoschlosser in Box 8) Hans had a full drivers license and as such was issued with a military divers license that also came with this grouping. This were printed on seal paper and usually also carried the soldier’s photo, though not in this case. both the units he served in as we shall see. This FPN can also be seen on the stamp of his Ost Medaille Urkunde. Inside view. Photo would have gone on the right. The word ‘verbrennungsmaschine’ means combustion engines, so he could drive petrol driven motorbikes, cars and lorries. 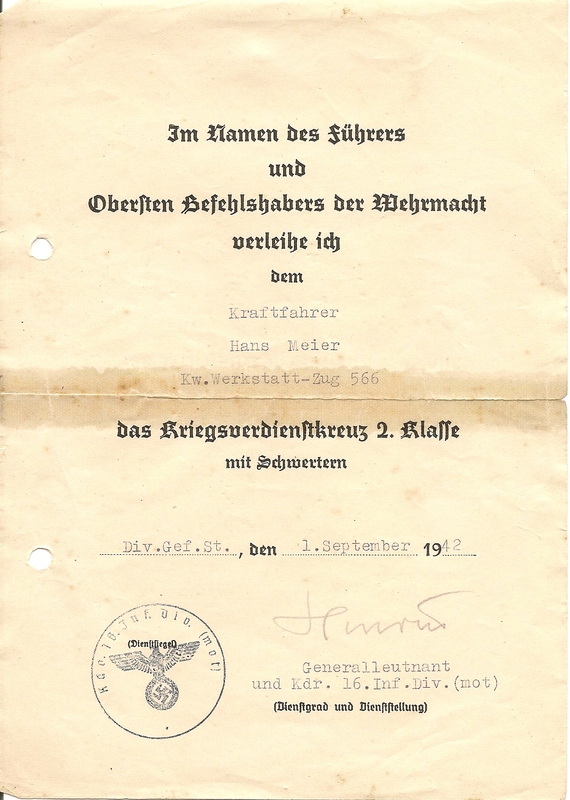 Wehrpasse were issued to all men of military age that were called up by their Wehrkries, a regional unit that controlled recruitment across the areas of the Reich. They managed the flow of replacements into the Ersatz und Ausbildung Battalions (Training Units) defore the recruits entered front line service. There are three types of cover for Wherpass. The early and pre-war Wehrpass had an stylised eagle with dropped wings. The mid and later war Wehrpass had a more military looking eagle with straight wings, The main difference is that the late war Wehrpass has the word ‘Wehrpass’ printed in Latin print rather than the Gothic used in the earlier versions. 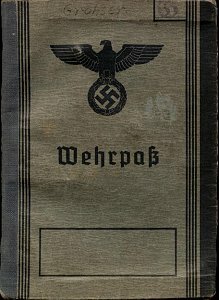 Hans Meier’s Wehrpass is of the Mid-War Type, an example cover is shown below. In the small box occupying the top right hand corner of the pass the owners initial would be printed, this would aide clerks rifiling through filing cabinets at the units depot. The branch of service would often be stamped on or written in the alrge rectangle under the eagle. The words ‘Heer’ (Army), Luftwaffe (Air Force), Kriegsmarine (Navy), or Waffen SS (Armed SS) would normally be printed here but not all the time. The first page would include the soldier’s Wehrnummer, that would be replicted in the Unit’s Stammrollen. 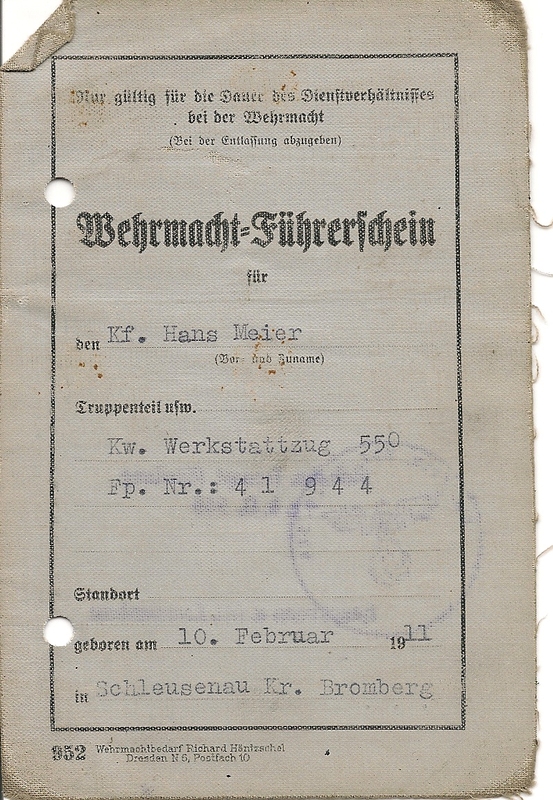 His name as well as his ID Number (If applicable not in this case), his Workbook number (Nummer des Arbeitsbuches) and his dog tag number (Erkennungsmarke). In Hans’ case his dog tag was stamped Kw.Werkstattzug.550/5. 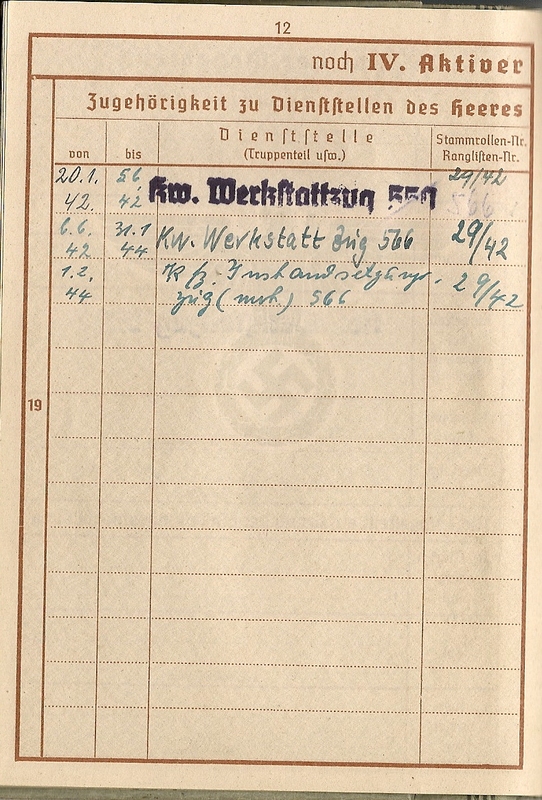 The bottom half of the page held all the administrative information of the Wehrbezrikskommando. I have started to research the grouping to Hans Meier, a soldier that served in the Wehrmacht during World War Two in the maintenance and work shop company of the 16th Infantry Division. This Division was a very famous division in the German Army and was indeed a motorised one. It fought in the campaigns in the West and was part of PanzerGruppe 1, Army Group South when Operation Barbarossa started on the 22nd June 1941. It fought at Dubno, Kiev and then held the line around Kursk when the Red Army counter attacked during that first Winter of the Russo-German War. Hans joined the Division in January 1942 and thus missed the first battles in Russia but was with the 16th when Fall Blau, the German summer offensive in 1942 that culminated with the defeat at Stalingrad, started in mid 1942. The battle list in his Wehrpass is long and detailed and I will go into it in a later post but the 16th Motorised Infantry Division drove eastwards across the steppe towards the Great Bend of the Don and then the Volga. It was not swept up in the maelstorm of Stalingrad as it was largely kept in reserve during late summer and autumn and when the Russian counter offensive encircled Sixth Army in Stalingrad in November 1942. MOre detail later. 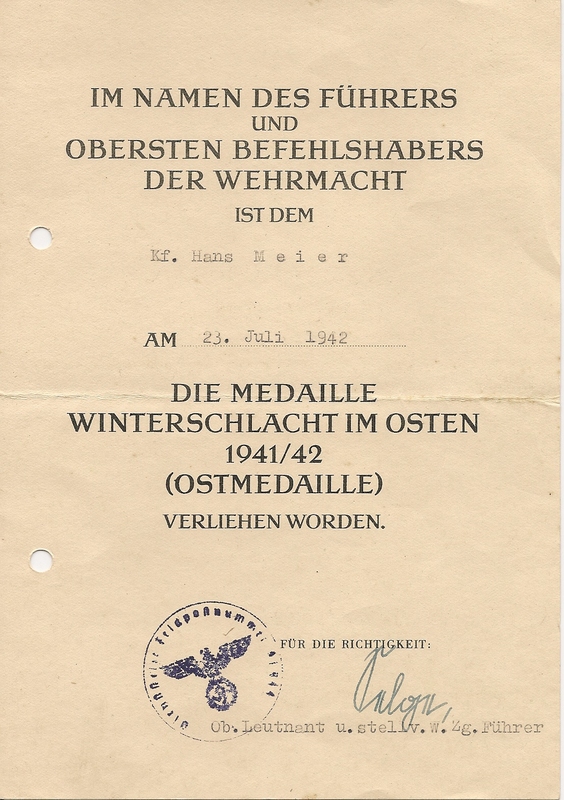 Hans was awarded two medals. 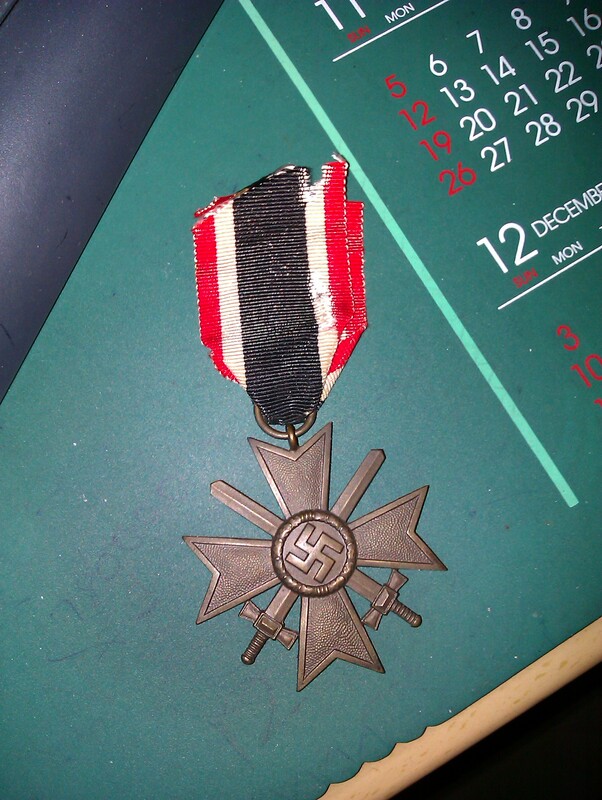 The first was the Ost Medaille, or Winter Medal, detailed later, and the second was the Kriegsverdienstkreuz II Klasse mit Schwerten, War Merit Cross with Swords Second Class. He also was awarded the corresponding Urkunde (certificate) that was signed personally by his divisional commander Sigfrid Henrici. I am currently researching a Wherpass, military service book, of a soldier that was in the workshop company of the 16th Motorised Division. 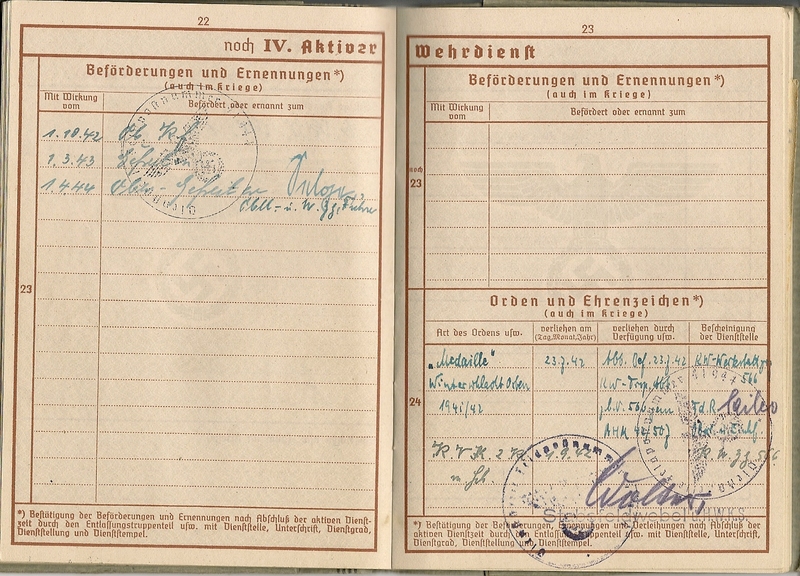 Along with the Wehrpass I was able to acquire his military drivers license and his two awards and their certificates. As I finish the research I shall be posting it here.